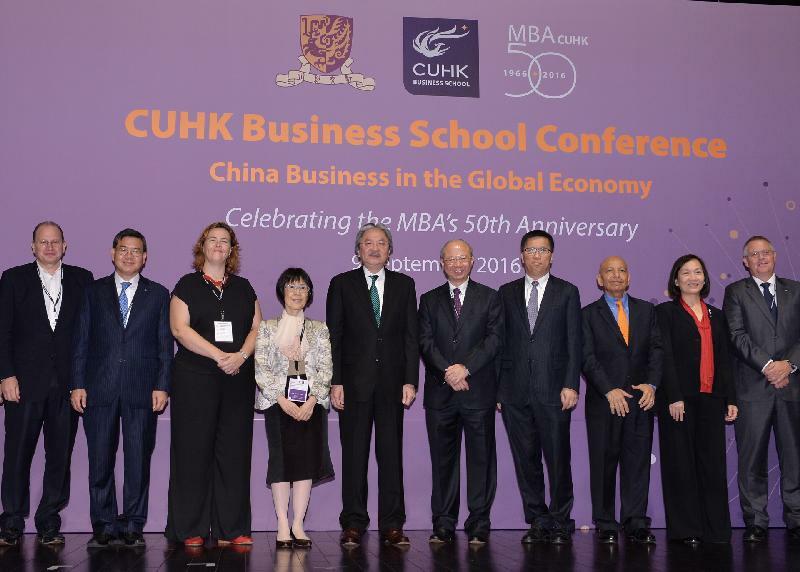 It is my great pleasure to be here today for this very special occassion, the signature event in the year-long celebration of the MBA programmes established by the Business School of the Chinese University of Hong Kong 50 years ago. They were, to be sure, Asia's very first MBA programmes at that time. The same year that these programmes began here in Hong Kong, I remember clearly, and indeed fondly, that the TV series "Star Trek" was launched in America. Endlessly "enterprising", both the MBA programmes and "Star Trek" are still with us today. At the last count, "Star Trek" had explored six TV series and 13 movies. The Chinese University's MBA programmes, meanwhile, have graduated some 6,600 students from more than 40 countries, bringing outstanding business education and innovation, to Hong Kong and the world - if not, quite yet, the stars in the distant galaxies. To mark that half-century of success, and to set the standards even higher for the next 50 years, the School has organised this meaningful international conference, with the propitious theme, "China Business in the Global Economy". In fact I had rewritten my speech in the last few days for this occasion because I was in Hangzhou just a couple of days ago, attending the G20 Leaders' Summit as a member of the Chinese delegation. The G20 Summit is probably the most politically potent forum today. G20 economies account for two-thirds of the global population and over 80 per cent of the world's GDP. It is therefore vital for Hong Kong, a small and externally oriented economy, to have an opportunity to be present at this premier international occasion under the "one country, two systems" framework. Hong Kong's participation in the G20 will not only allow us to keep abreast of the policy directions of major economies in the world, but also to accord us the opportunity of furthering our bilateral relationship with our key trading partners from around the world. The Summit this year carried even more weight, not just because China played host to the Summit for the very first time, but because of the high hopes that international communities had on this G20 Summit in coming up with effective and sustainable remedies to cure the ills of the global economy that has remained sluggish for simply too long. In fact, the G20 Summit in the current format involving leaders of the respective economies was only first inaugurated in 2008 in Washington, D.C. as a platform for major economic powers in the world to work out together ways to bring the global economy back on a rising trajectory in the aftermath of the 2007 financial crisis. Before 2008, it was just a platform for finance ministers to discuss issues affecting the world economy. I attended that first G20 Summit in Washington, D.C. and the following 10 summits that were staged in different cities, from Brisbane and London to Seoul and Saint Petersburg. So what really surprised me, and basically everybody else I guess, is that the global economy has hardly recovered after all these years. Indeed, the global economy, as we speak, is still struggling, and the prospect is seemingly bleak. There is a lack of demand from major economies, resulting in insufficient growth momentum around the world. The latest economic data of the US contain mixed messages about the health of its economy, while the economies of the Eurozone and Japan are still worryingly fragile. Coupled with the anxieties over the timing and the pace of the US interest rate hike, the divergent policies among major central banks around the world, the geographical conflicts in the different regions, as well as the uncertainties arising from Brexit and so forth, we have all the ingredients for a perfect storm. These are the exact reasons why the world was looking eagerly to the Hangzhou G20 Summit for inspiration, for vision, for solutions, as well as for leadership in reviving economic growth and in tackling the risks and challenges ahead. While it is unrealistic to expect the G20 Summit to have a silver bullet that could cure all the problems, I think it would be worthwhile for me to share with you today my takeaways from the Summit, as well as how China can play an even more influential role in achieving these visions. The theme of this year's G20 Summit was "Toward an Innovative, Invigorated, Interconnected and Inclusive World Economy". When addressing G20 participants at the Summit as well as the press conference at the conclusion of the Summit, President Xi elaborated in depth on how the world can join forces in realising these targets as represented by these four "i"s, through strengthening macro-economic policy co-ordination, fostering innovation-driven growth, stimulating trade and investment, as well as encouraging inclusive and interconnected development. First and foremost, it was felt that all economies should work together to strengthen policy co-ordination and co-operation in driving global economic growth and safeguarding financial stability, employing the use of monetary and fiscal measures as well as structural reform. G20 members indicated their commitment to continue to strengthen communication and co-ordination of macroeconomic and structural policies, and at the same time refrain from competitive devaluation of their own currencies. Through these measures, it is hoped that the global financial mechanism can become more resilient to shocks, and volatilities and disorderly movements of exchange rates can be reduced substantially. Secondly, it is felt that the G20 economies should actively adopt innovative technologies in exploring a new path for growth. The Mainland itself has been a successful example of catalysing economic growth through the buttressing of innovation and the application of technology in the real economy. Initiatives such as "Internet plus", mass entrepreneurship, and "Made in China 2025" are strategic elements of the National 13th Five-year Plan that have been implemented since March this year. China nowadays is more than just the world's factory. It is also a worldwide leader in e-commerce as well as an international hub for advanced telecommunication technologies and manufacturing. The surge of start-ups in the IT and software sectors, coupled with the rising investment in research and development, will provide fuel for this new growth engine. Thirdly, the G20 urged its members to continue to embrace an open and free global economy and to commit themselves to liberalisation and facilitation of trade and investment, because a more open global environment, with freer flow of goods, services, capital as well as talents, will better facilitate sustainable and balanced growth of the entire world. Unfortunately, we have been witnessing of late a disturbing resurgence of protectionism as well as an anti-globalisation movement that is gaining momentum around the world. The effectiveness of multilateral trade agreements has been weakened by tightened trade restrictions in respective countries. Free trade has been the cornerstone for the sustained success of Hong Kong, and our economy is highly dependent on trade with the rest of the world. We are currently the world's eighth largest trading entity, with total goods and services trade equivalent to more than four times our GDP. The free flow of trade and capital makes us a champion of economic freedom, as well as a well-recognised international trade and financial centre. I believe it is particularly important for Hong Kong that the G20 economies should stand firm against protectionism in trade and investment, and put in extra efforts to maintain an open and free trade network that can reinforce sustainable, robust and inclusive growth for the world. And that leads us nicely to the last key target of the G20 Summit this year – building an inclusive and interconnected global economy that can benefit developing and low-income countries as well. The G20 members recognised that infrastructure connectivity as well as quality employment are keys to achieving sustainable development and shared prosperity. The economies undertook to take effective action to support infrastructure projects and entrepreneurship, and to foster more decent job opportunities for all. While China has successfully staged the Hangzhou G20 Summit, I am certain that it will play an even bigger role in the delivery of the proposals endorsed and promises made in the Summit. China, no doubt, will continue to be the key force driving the global economy forward, through economic reform that is underway and through the further opening up of its markets. In the increasingly interconnected global economy that we have today, some argued that the slowdown of China's economy would have strong spillover effects that would add further downward pressure to the already weak global economy. I actually don't see it that way. Economies around the world have been facing substantial headwinds in recent years, in fact since 2008, and China cannot be an exception in this issue. While China's economy has been growing at a slower rate, it is still the major driving force of the global economy that is contributing over a quarter of the world's economic growth every year. In fact, it is not unreasonable that the Chinese economy is now growing at a slower pace, following the double-digit spurt in the past three decades. Since the beginning of its opening up in the late 1970s, the Mainland's economy has ascended in a phenomenal way to become the world's second-largest economy, the largest trading economy as well as the largest manufacturer of goods. China's GDP actually expanded nearly 30 times in real terms from 1978 to 2015. Let us be realistic. The growth target of 6.5 to 7 per cent in 2016 is not exactly depressing news. I believe most of the leaders at the G20 Summit would happily settle for half of that. As President Xi highlighted in his keynote speech at the B20 Summit that was actually organised for the business sector alongside the G20 Summit, China will ensure to deepen its structural reform, to open up its market and to further integrate into the world economy. China is confident and capable of maintaining medium-to-high-speed growth, and China will continue to be the growth engine of the world in the 21st century. Apart from the host of monetary measures that it can deploy, the Central Government is also adapting a more proactive fiscal policy, putting forward a larger deficit budget in 2016 than the previous year, with a view to supporting enterprises and stabilising growth. With its large fiscal reserves, I believe that the Mainland has sufficient policy levers that can be pulled to guide the economy in moving forward in a stable manner. The Mainland economy is on track to meet its growth target this year, no doubt. Part of this expected growth can be attributed to the continued structural reforms, including, for example, the supply-side structural reform and change in demand composition. Retail sales have maintained double-digit growth so far this year. Thanks to the increasing purchasing power, together with the rising income of its expanding middle-class, the Mainland's investment and export-oriented economy is being gradually supplanted by a more consumption-driven economy. That's a very important aspect that we need to recognise. That transformation is, indeed, notable. Consumption expenditure is now the Mainland's largest growth driver, accounting for more than 70 per cent of its economic growth in the first half of 2016. As the Mainland's economy becomes more services-led, there is also a growing demand for high-end producer services, from financial to a variety of professional services. This, in turn, creates tremendous business opportunities for services providers around the world, particularly for those in Hong Kong. While the Mainland has long been a major destination of foreign direct investment, it has also, in recent years, emerged as an investor in international markets, creating massive opportunities for all concerned. This is reflected in the explosive increase in the Mainland's outward, non-financial direct investment - from about US$3 billion in 2003 to US$118 billion last year. That, by the way, was largely on par with its inward foreign direct investment for the year. The Mainland's "going global" strategy encourages its companies to tap into overseas business opportunities. It also allows financial, human and knowledge capital to flow more freely across economies. This will certainly help Mainland enterprises move up the global value chain, and help the Mainland integrate into the global economy. This, in turn, will be extremely beneficial to Hong Kong. You will all agree that Hong Kong has played a dynamic role in the dramatic economic evolution of the Mainland since it started in the late 1970s. Hong Kong entrepreneurs brought with them capital and skills when they moved their factories from Hong Kong across the boundary to the Pearl River Delta in the early 1980s, and helped release the enormous potential of the two key factors of production in the Mainland, labour and land. When the Mainland emerged later as an export economy and a major manufacturer, Hong Kong's competitive advantage in trade and logistics made us a key entrepôt for the Mainland. Hong Kong has also served as the key intermediary in channelling foreign investment and capital to fuel the Mainland's rapid growth. As the Mainland's economy expands, Hong Kong became the country's international financial and professional services centre. We have been able to seize the unprecedented opportunities offered by the Mainland, which has been pushing forward the opening up of its capital account and the internationalisation of its currency, and emerged as the world's leading offshore Renminbi business hub. In turn, Hong Kong also facilitated the continued opening up of the Mainland's financial markets. To be sure, there will be more opportunities for Hong Kong down the road in contributing to the development of the Mainland's economy. More opportunities will be realised following the implementation of the grand and visionary strategy of the Belt and Road Initiative. Making good use of our financial, trade and logistics strengths, as well as our project management prowess, Hong Kong can become the key investment and financial-services hub for the Belt and Road Initative. Hong Kong's services sector complements the intention of the initiative well. Multilingual professionals in accounting, law, architecture, engineering and real-estate, for example, have the international experience to lead consultancies and manage infrastructure projects along the twin corridors. Of course, with our internationally respected research and development talent, and with our excellent universities and research infrastructure, we can actively participate in the Mainland's innovation drive. Ladies and gentleman, Hong Kong has benefited tremendously from the opening up of the Mainland's economy in the last 40 years. We have also contributed significantly to the development of the Chinese economy, and we shall continue to make a contribution to the development of the Mainland's economy. 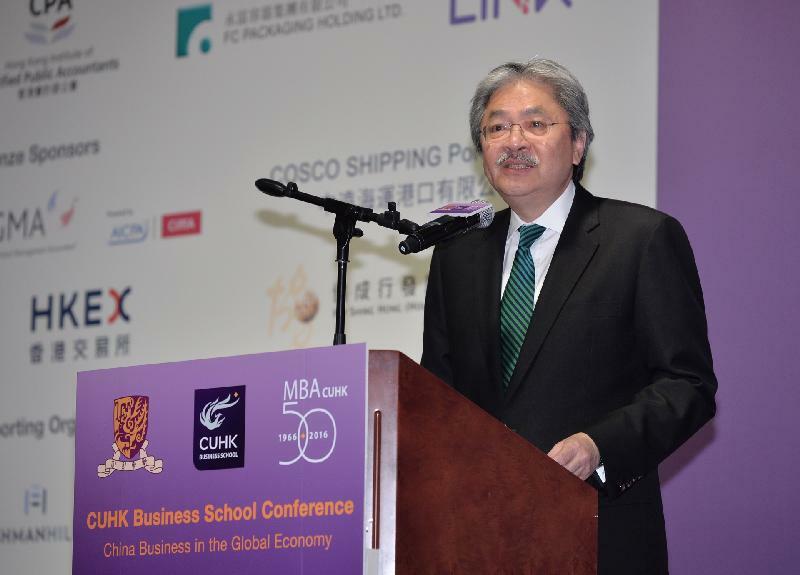 I am confident that Hong Kong, blessed as we are with formidable advantages - and that certainly includes the Chinese University of Hong Kong, and its Business School - remains in the pre-eminent position in seizing the opportunities arising from the developments in the greatest economic miracle that has been recorded in the civilisation of our time. We shall definitely boldly go where no economy has gone before.